I love this passage - it is so simple yet so hard to walk out. I believe the essence of this verse sums up the 10 commandments and, what Jesus called, the great commandments ... to love God and to love each other. This verse adds some clarity to loving ... says a little bit about what love looks like. To act justly. The dictionary defines justice as "The upholding of what is just, especially fair treatment and due reward in accordance with honor, standards, or law." God is a deeply concerned with how we treat each other. When we love each other we are also deeply concerned that others are treated fairly. 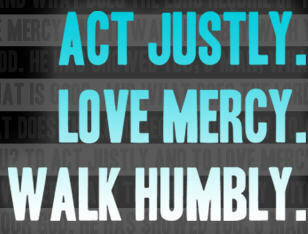 Jesus said to do unto others as you would have them do unto you ... this is the heart of acting justly. To love mercy - oh how the standards in God's kingdom are high. Jesus confronted the leaders of His day by telling them to discover what it means when God says He desires mercy and not sacrifice. We, like the leaders of Christ's day, often can't see the proverbial forest of mercy for the legalistic trees of our traditions. How we often judge each other when it is on God's heart to show mercy. Isn't it interesting how it says to love mercy ... could it be that we show our love when we are merciful? To walk humbly. I have often said that humility for a believer is not optional ... you humble yourself or God humbles you ... and we all know that the former is much better than the latter ... He lifts us up when we initiate humility. I think that it is only when we walk in humility that we can truly act justly and love mercy ... humility at it's core is just and merciful. What is good. 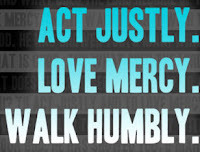 Justice, Mercy and Humility ... they are good ... they are required ... they are not optional. Jesus personified each for us ... the most just ... the most merciful ... and the humblest man that ever lived. May our lives reflect Him in justice, in mercy and in humility. AMEN!!!! This says it all and sums it all up. Now, to us and the doing!!!! !